Kimberley Caravans and Motorhomes are one of the largest new and used caravans and motorhome dealers in the North East of England with over 30 years of trading. We supply a great number of caravan and motorhomes brands at our Darlington branch, such as Bailey, Coachman, Compass, Hymer, Swift, and Xplore, plus many more used brands. We are one only a handful of official Hymer motorhome dealers in the UK, providing our customers in the North East and Scotland with the excellence of this German brand. If you're looking for caravans and motorhomes in or around Newcastle-upon-Tyne, Teesside, Durham, York or Sunderland, you'll find us just a stone's throw away from these major cities. Here at Kimberley Caravans and Motorhomes of Darlington, we want you to leave with everything you need to have the best caravanning or motorhome experience possible. That is why we provide additional products and services such as our on-site awning shop; where you can choose from a wide range of both caravan and motorhome awnings including inflatable caravan awnings, lightweight porch awnings and full motorhome awnings. Our accessory shop includes caravan and motorhome accessories for camping and getaways, and we also offer servicing and repairs for both motorhomes and caravans from our 7 bay workshop. If you are looking for your next motorhome destination, why not have a look at our places to visit in Scotland page for more inspiration after buying your new motorhome from Kimberley's Darlington branch? We know buying a caravan or motorhome is a big decision, and you want to be sure you're choosing the right one. That is why we want to take the pressure off. You can browse our ranges at your own pace or relax in our café. Hot and cold food is served daily freshly prepared on the premises using locally sourced produce. No matter where you have come from in the country, we have both car parking and motorhome parking facilities available. We can accommodate overnight wild camping, just let us know first and be ready to pitch up when you arrive. Free Wi-Fi is also available on site! Our Darlington branch also offers secure storage; you can feel safe leaving your caravan or motorhome in our hands. We have many safety measures in place including, controlled access, CCTV monitoring, and a full perimeter surrounding fence. With 75 plots and larger pitches for the bigger caravan or motorhome, get in touch if you are interested in storing your vehicle in the north east of England. Serving the North East of the country, Kimberley's Darlington Branch is easily accessible from many town and cities in the north of England. 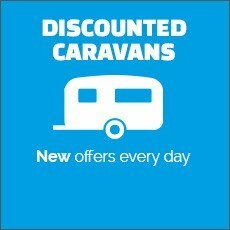 Whether you are travelling from Newcastle-Upon Tyne, Sunderland, Bishop Auckland, Teesside or Durham, you can find a great range of new and used caravans and motorhomes at our Darlington branch. The wide variety of new and used caravans and motorhomes is well- worth the short drive to Kimberley Darlington. Why not take your new caravan or motorhome out to one of our neighbouring cities? For historical architecture visit Durham for its gothic cathedral and Norman castle. Or, if you are looking for vibrant nightlife and a busy city centre with plenty of places to explore, Newcastle-Upon-Tyne and Sunderland are the perfect pit stops in your new motorhome or caravan. Situated between three national parks, the North Pennines, North York Moors, and Yorkshire Dales, you can take your pick for your first holiday destination in your new or used caravan or motorhome. There is also the option of visiting the fabulous coastal resorts of Whitby or Scarborough. Families with children will enjoy visiting the Forbidden Corner in the Yorkshire Dales or the Beamish Museum between Durham and Sunderland for a fun-filled day out, knowing that you can return to your caravan or motorhome for a well-deserved rest! Kimberley's Darlington branch is the ideal place to visit nearby Scotland from in your new motorhome. We have compiled a Places to Visit page for more inspiration for your next Scottish adventure. Located at Burtree Gate at the A68, just off junction 58, A1 and 10 minutes north of Scotch Corner.